Duke Edmundson was the first local hockey player to make it to the NHL. His basic skills were developed on his backyard rink, unsupervised scrimmages on the schoolyard rink and in the old Wapiti Arena where he was a rink rat. Duke’s Dad was passionate about hockey, played for the pre-war Red Devils and coached Duke as a minor. Duke inherited his Dad’s passion for the game but took his Father’s skills to another level. Duke was big, strong and talented beyond his years and groomed his ability while playing senior hockey with the Grande Prairie D-Company as a fifteen year old. At age sixteen Duke signed a "B" card with the Montreal Canadiens and as compensation received $100 and a new pair of skates. 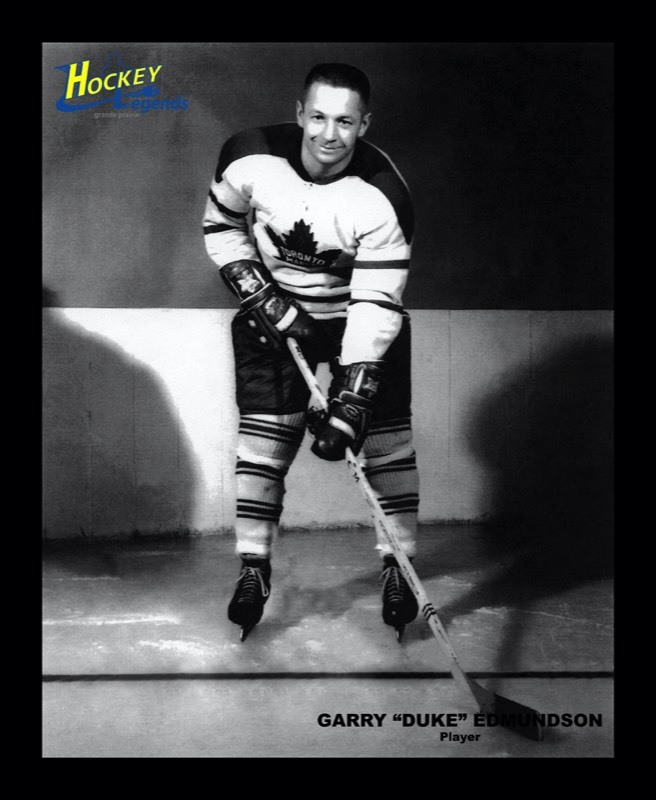 After two seasons (1948 to 1950) with the Edmonton Athletic Club, Edmundson moved to the Regina Pats (WCJHL). The next season Duke played junior hockey with the Kitchener Greenshirts of the Junior OHL. He was called up late in 1951 to join the Canadiens for their last regular season game and the first round of the Stanley Cup Play-offs against the Boston Bruins. Unfortunately, Duke dislocated his shoulder the following year at training camp, required surgery and dropped down to the Montreal Royals farm team. Seven years passed before he would suit up for another NHL game. His best years came in 1955-56 and 1956-57 when he was named to the International Hockey League's first, then second, All Star Team. In 1958-59 Duke joined the Springfield Indians of the American Hockey League. With the Indians Duke scored 17 goals from his left wing position and, with 27 assists, had a season total of 44 points. That summer, in an inter-league deal, the Indians traded Duke to the Toronto Maple Leafs. Duke’s return to the NHL was in a Leaf’s jersey. With Toronto in 1959-60 he played 39 games registering four goals and ten points. He played on a checking line with Jerry James a running back for Winnipeg of the CFL, and with hockey's iron man, Johnny Wilson. The following year he played three more NHL games finishing the year with the Rochester Americans of the AHL. The last three seasons of Duke's career were spent in the Western Hockey League with the San Francisco Seals. From time to time since then Duke has suited up with an old timer team from San Francisco and players who have played for and against him comment that it is remarkable how he can control a game. During his eleven years of professional hockey, Duke accumulated 242 goals and 377 assists in 692 games, along with 1,022 minutes in penalties. In keeping with hockey players who learned the game in Grande Prairie, Duke was noted for his rugged performance. Duke Edmundson - a Grande Prairie Hockey Legend in 2004.